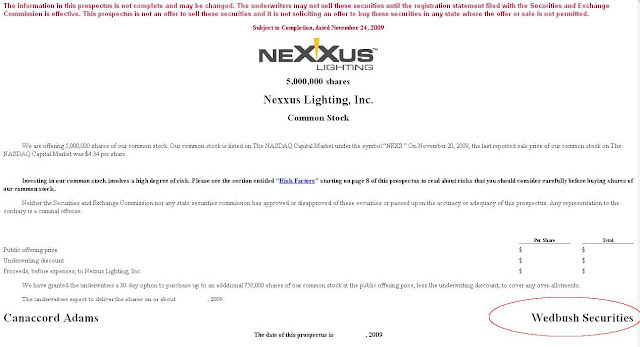 Nexxus Lighting (NEXS) is a Charlotte, North Carolina based firm that designs, produces and sells LED lighting and fiber optic lighting products. Despite these results, Wedbush Morgan initiated coverage with a Outperform rating and an $8 target today. That target implies upside of 126% from the current price, yet shares are DOWN! Maybe the Outperform rating on this stock was in exchange for fees from the recent stock offering, of which Wedbush shared part of the $1.35million in fees? That amounted to "commission" of about 8% of the entire offering price, pretty ugly for the company. Maybe uglier than the expensive fees was the use of proceeds. While some money will be used for operating purposes, a big chunk will be used to repurchase preferred stock and promissory notes owned by firms directly related to the company's board of directors, as well as issuing these entities warrants to purchase stock in the future. No wonder other investors are running away. 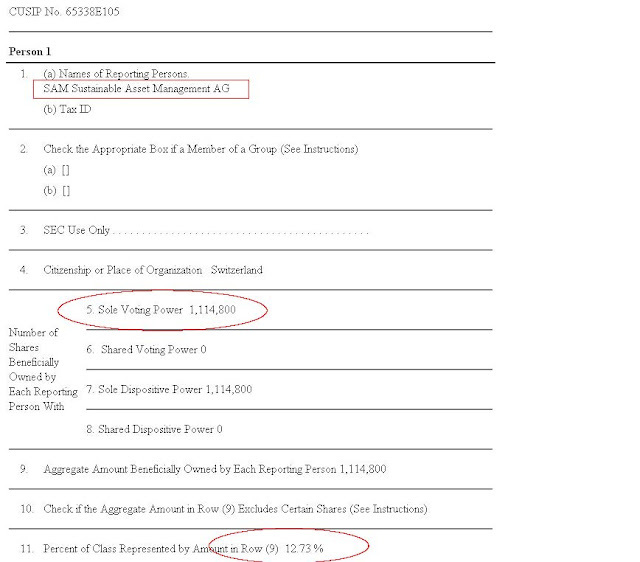 "In addition, simultaneously with the closing of this offering, we will exchange the remaining 480 shares of our Series A preferred stock, with a stated value of $2,400,000, which are owned by certain of our directors or entities affiliated with them, for convertible promissory notes in the aggregate principal amount of $2,400,000 and warrants to purchase an aggregate of 935,040 shares of our common stock. Of this amount, entities affiliated with Mariner Private Equity, LLC, of which Patrick Doherty, one of our directors, is president, will receive convertible promissory notes in the aggregate principal amount of $1,650,000 and warrants to purchase 642,840 shares of our common stock and Michael Brown, one of our directors, will receive convertible promissory notes aggregating $750,000 and warrants to purchase 292,200 shares of our common stock"
"We intend to use approximately $4.0 million of the net proceeds from this offering to repay all of the outstanding principal amount and accrued interest on secured promissory notes we issued in June 2009. The holders of such notes include certain of our directors or entities affiliated with them. In connection with the repayment of our June 2009 secured promissory notes, entities affiliated with Mariner Private Equity, LLC, of which Patrick Doherty, one of our directors, is president, will be repaid $1,500,000 in principal amount plus all accrued but unpaid interest and Michael Brown, one of our directors, will be repaid $100,000 in principal amount plus all accrued but unpaid interest." I wonder what Nexxus' largest shareholder thinks of this deal, or if they even have a clue. Sustainable Asset Management of Switzerland recently became the large stockholder, owning about 12%. Sustainable maybe, but profitable might be a stretch.